Loved it! Worth every second! I highly recommend it! Thank you. I have been working on my values and goals for some time and this program has helped me to focus and clarify them. I would like to say that I have immense gratitude to Robin for this course. He has offered an affordable course that can and will continue to offer us HUGE value. So thank you. 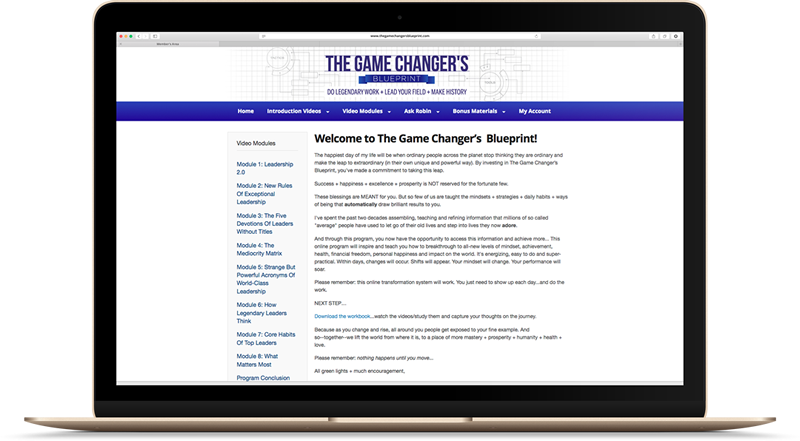 The Game Changer’s Blueprint is a total system that is already helping people just like you from across the world get amazing ambitions done while creating a lifestyle they love! If you are reading this right now, I know you want to transform. I know you are frustrated with where you are and where your life is going. Consider this your wake-up call. It’s time to make a decision and choose mastery. Standing in the old rusted mental architectures is exhausting on every level. The inefficiency goes far beyond financial shortfall, it shows up in your inability to connect with your family, your friends, and to see and embrace opportunities. Mediocrity comes at a high price. Risk nothing and you risk EVERYTHING. Let me help. I have created this program with infinite devotion to your best life.